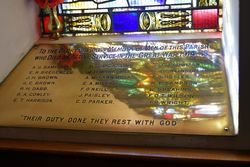 A stained glass window and brass honour roll commemorate those who died in service or were killed in action in World War One. At St. Paul's Church of England, Camperdown, on Sunday morning, a large congregation was present at the dedication of the Soldiers' Memorial Window and Tablet. The church had been beautifully decorated with greenery and snow-white chrysanthemums, which were clustered beneath the pulpit drapings. Venerable Archdeacon Bennett, of Warrnambool, was assisted by Rev. E. S. Yeo, in conducting the service, which was slightly different from the usual morning service, including special prayers and exhortations, and a special Litany in commemoration of the fallen. Lessons were read by Mr. John Manifold. Archdeacon Bennett, in his stirring sermon, made an eloquent appeal to the large congregation, all the members of which were touched by his fine address. He then dedicated the window and tablet, and unveiled the tablet. The service concluded with the National Anthem and the Benediction. Camperdown Chronicle (VIC), 26 April 1927. "Their Duty Done They Rest With God"